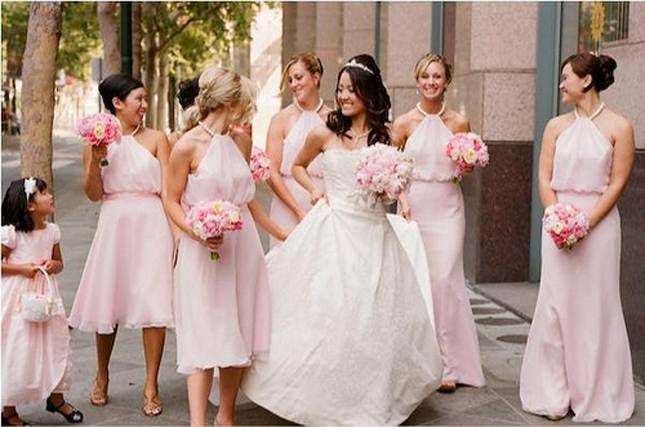 For the last few years, mismatch bridesmaid dresses has been one of the hottest trends on weddings. 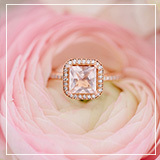 Everyday visiting my favorite blogs, I discover tons of style-savvy brides who find the most creative ways to follow this trend. 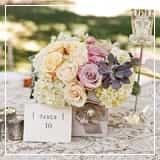 After all, I believe that allowing your bridesmaids to choose their dresses according to their budget, taste and type of body is a fabulous idea. 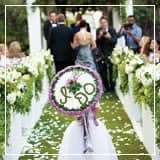 If you decide to incorporate this plan to your wedding, just remember, the biggest secret of successful mismatching bridesmaids is to make your girls wear different dresses yet still look like your team… your bridal party. 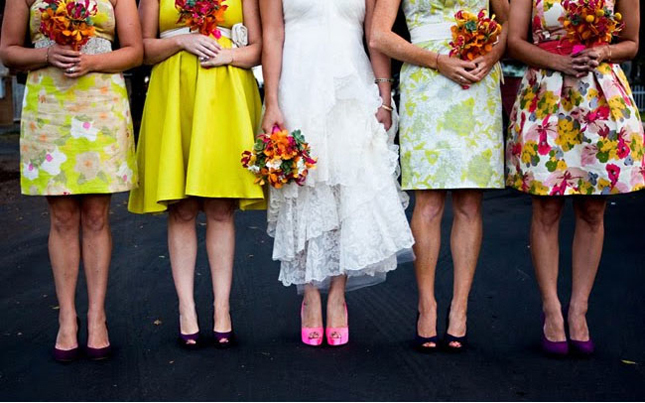 Bouquets, accessories and colors are elements that will help you achieve a chic mismatched bridesmaids look. Option No. 1: Same color, different shades. 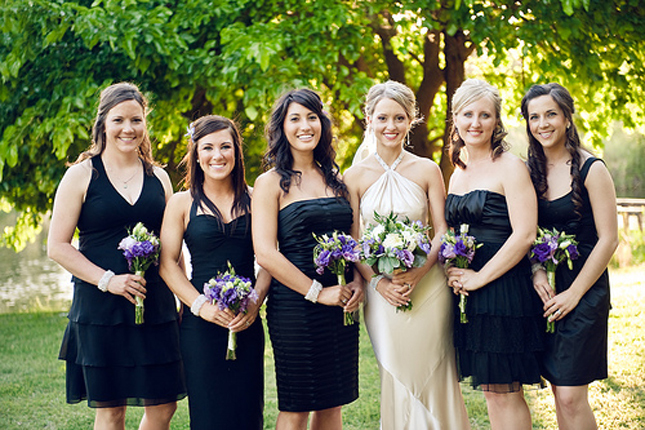 Neutrals, including grey, are so hot this year, especially when it comes to bridesmaid dresses. Neutrals give mismatched dresses a more unified look than any other color. 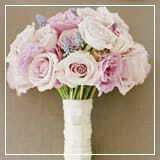 Try them all in a short length like the first image (source) to give you, the bride, a more distinctive look. Or for a more edgy approach mix long and short dresses like image #2. 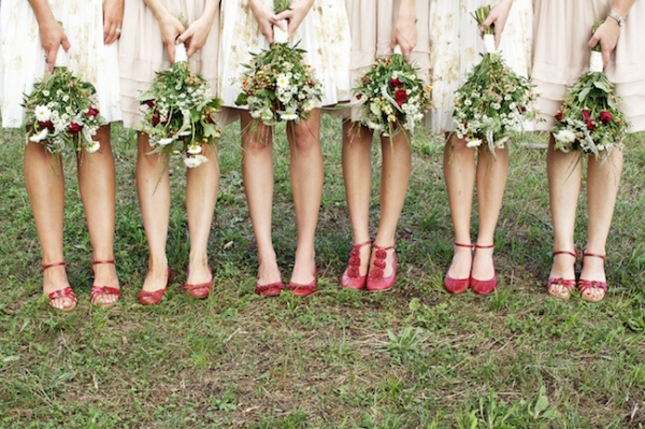 For those brides that want their bridesmaids to match their wedding colors, the third image gives you the perfect example on how to do it in a color as radiant as red. Same length, same bouquet, patterned tights and same color shoes are the elements this bride used to bring together her bridal party look. Almost the same case apply to the last photo… this one… this one is just pure mismatched beauty. Option No. 2: Different colors, same style. 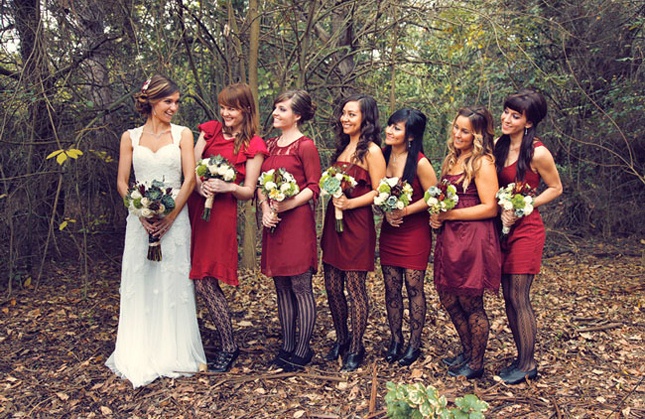 Some brides would like to follow this trend, but they still like to choose their bridesmaids’ dresses. Option number 2 is for them. 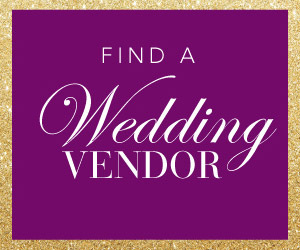 Pick the exact same dress in the different tones of your wedding color palette looks amazing and gives your bridal party a pop of color. 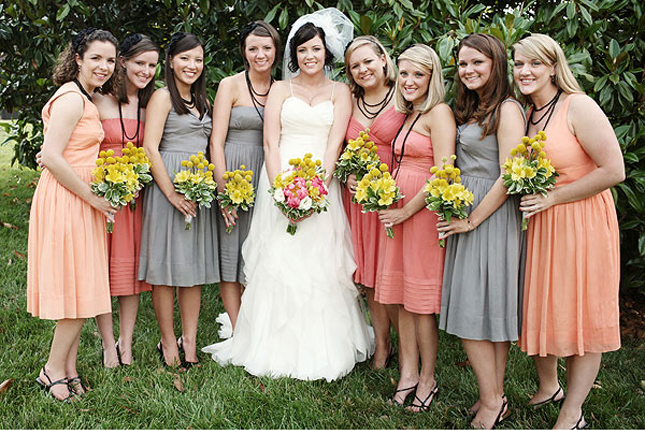 (photo no.1) You may also choose three or four different styles and colors and let your bridesmaids determine what fits them best, like bride number two. For a more eclectic appearance, choose the same patterned skirt with a different color top (image #3). 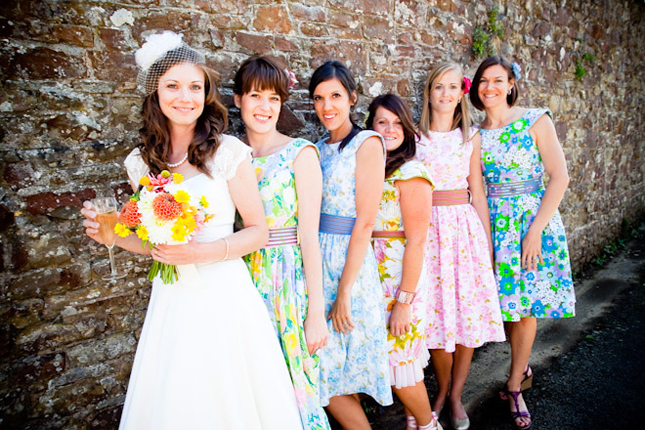 Or follow the steps of bride number four by choosing a patterned dress and let your bridesmaids decide on the color. Option No. 3: Same color, different style. 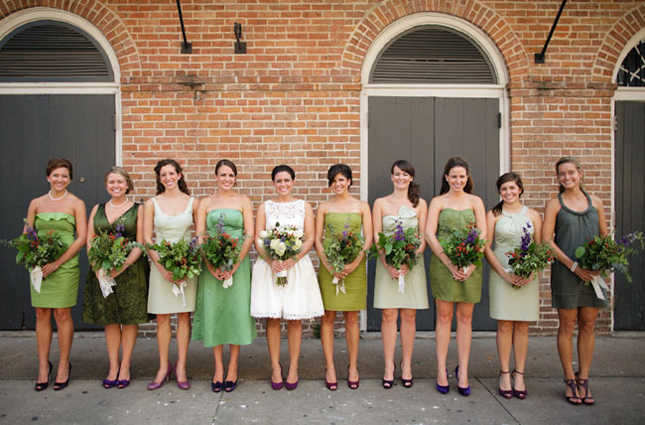 Give your bridesmaids the exact color or even the fabric you would like them to wear and let them came up with their own dress. 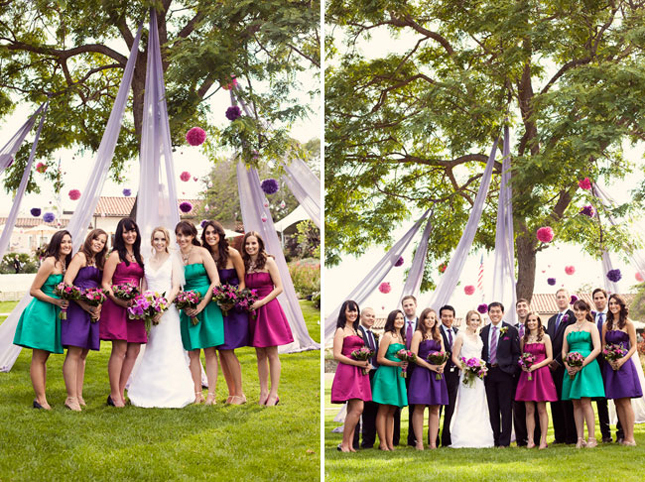 (picture 1, picture 2) Or pick two or three variations with the same dress (image 3, image 4). Option No.4: Same dress, mismatched accessories. 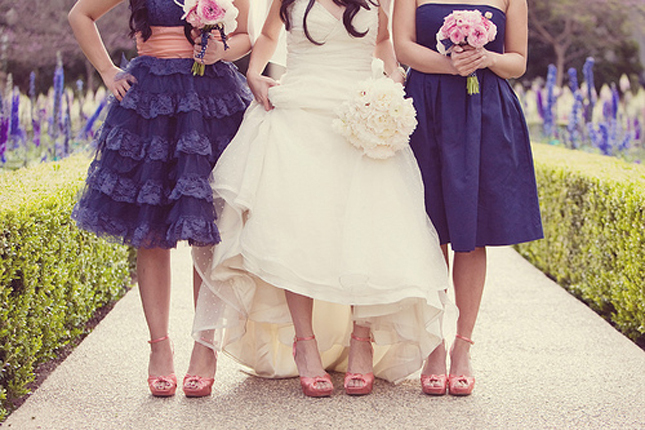 For a more settle mix keep the same dress for all your girls and mismatched the accessories. You have an infinity amount of possibilities to play with. 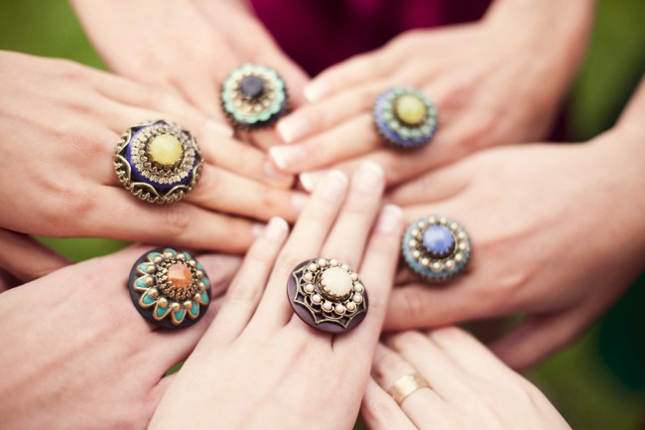 Earrings, shoes, cardigans, rings and necklaces are just some alternatives. If you feel like your girls have a great sense of style give them the freedom to wear what they have on their closets. 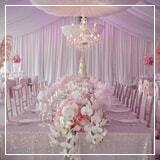 You can always provide some guidance about your wedding theme to keep the look together. 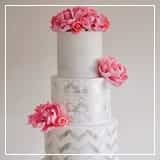 For brides who are looking for a vintage feeling this first image is a great inspiration. 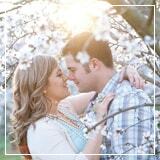 Glamorous stylish brides check out picture number two… it’s fabulous. 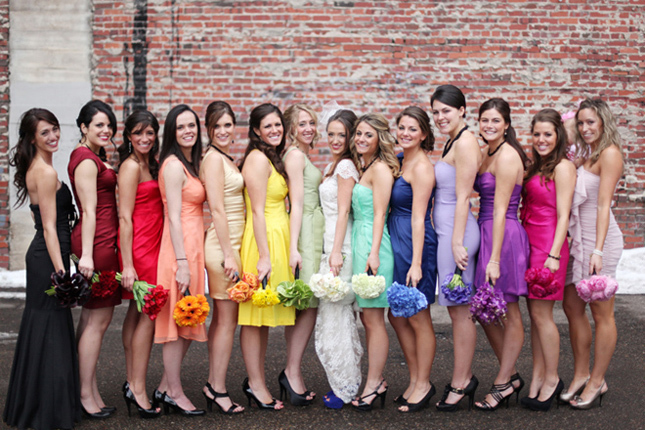 Many bloggers are going bananas with the idea of the rainbow bridesmaids, and I’m one of them. Isn’t it pretty? To accomplish this look make sure all your girls will wear different colors and that all the dresses have a simple and clean cut. 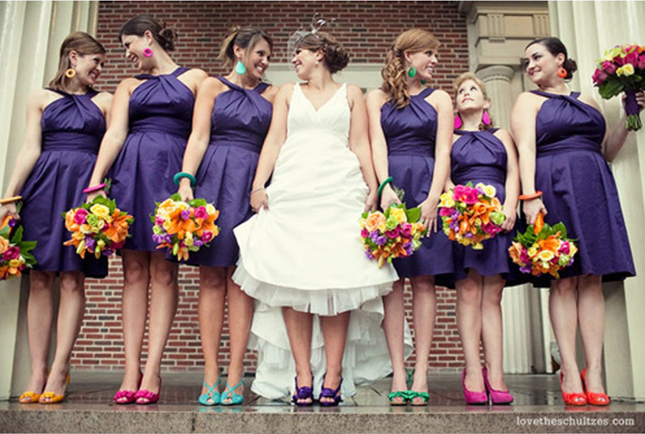 You can’t get enough Mismatched Bridesmaids? Then, I have good news for you! I made Part-2. Click here.